St. Martin's Griffin, 9781250095022, 80pp. Birds are the aesthetic masterpieces of nature. Now you can bring some to life with your colored pencils, markers, or even watercolor paint! Birds presents a new kind of mindful coloring book, containing over 35 astounding drawings inspired by illustrator Georgie Woolridge's travels in India and around the world. Each stunningly intricate drawing incorporates swirling paisley patterns and other local designs inspired by the styles in Thailand, Vietnam, Singapore, Australia, and New Zealand. By easing you out of your thoughts and into another world, coloring these beautiful images becomes a practical exercise in mindfulness that anyone can adopt, regardless of skill level. Each stunning illustration is accompanied by a brief paragraph about the bird and its habitat, in addition to a helpful introduction with hints and tips about drawing, coloring, and the various effects that you can achieve by using different coloring tools. Go ahead and ruffle some feathers! GEORGIE WOOLRIDGE is an artist who studied Art Foundation and Woven Textiles, graduating from Loughborough University in 2010. She most identifies with art that captures color and movement, especially intricate patterns. 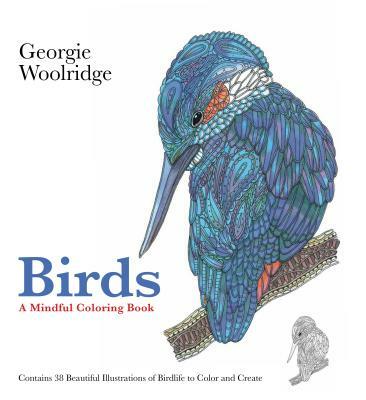 Georgie is the author and illustrator of Birds, Waterlife, and Animals. She lives in the UK.